I was expecting desert and Frenchmen but what I got was a bunch of Americans, a Dutch girl, and a smattering of others, and Tarzan. I got Tarzan so no complaints. Still, this takes place in Sumatra and it puts Tarzan into a new jungle with tigers instead of lions. It also takes place during World War II which made it a darker and more grounded book than most Tarzan tales. I found the juxtaposition of Tarzan against a more realistic foe jarring and hard to reconcile. I much prefer Tarzan in Africa even if the stories get a little repetitive. This time around, Tarzan starts the book in the guise of his alter ego, Lieutenant John Clayton, Lord Greystoke. He is in a plane that is shot down over Sumatra and he and the surviving airmen get involved with a Dutch girl who has been orphaned by the Japanese invaders. She's brave, tough, and resourceful and manages to win over this bunch of misogynists. The treatment of women in this book is actually quite good but the attitude towards the Japanese is appalling. 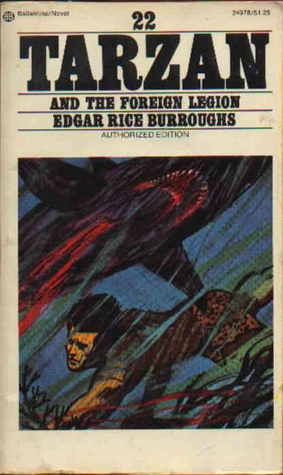 However, Edgar Rice Burroughs was not an outlier for his time. His attitudes and beliefs about "Japs" was typical for his place in time and needs to be understood in that context. I don't have to like it, however, and it was hard to overlook. The action is typical Tarzan with a lot of captures, escapes, and recaptures. Tarzan gets to save the day again and again and just be Tarzan, and that's all I need. And the man rose and put a foot upon it and, raising his face to the heavens, voiced a horrid cry —the victory cry of the bull ape. Corrie was suddenly terrified of this man who had always seemed so civilized and cultured. Even the men were shocked. Suddenly recognition lighted the eyes of Jerry Lucas. "John Clayton," he said, "Lord Greystoke— Tarzan of the Apes!" Shrimp's jaw dropped. "Is dat Johnny Weissmuller?" he demanded. What other author has so unironically referenced the real life movies made about his fictional universe? It's almost Inception-like in its self-reference. It would be like Jack Reacher making a comment about Tom Cruise being too short to be authentic or James Bond mentioning Sean Connery's Scottish accent. It was done without a touch of satire, just very straight and it made me laugh out loud. Speaking of laughing, there's a lot of humor in this one. The men in the party wrangle back and forth and it makes for some light moments in a book that could have been very dark. The romances are also well done and, for a very big change, there is even a multi-racial relationship. I wouldn't say this is the best of the Tarzan books but it's more original than most of the slush in the latter half of the series. I give it 3 1/2 to 4 stars.